On Sunday I knew I wanted to get some weight training in, and I also wanted to do something else to kill a bit of extra time I found myself with. 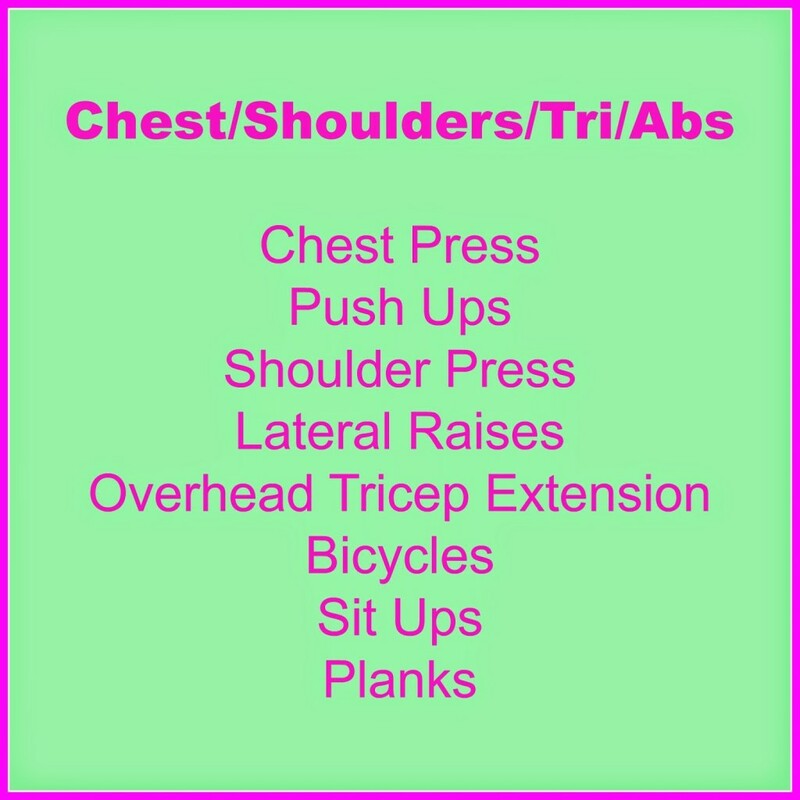 I ended up combining one of Meg’s workouts and one of Kim’s workouts … and let me tell you I was left dripping in sweat and feeling great at the end! I also did a set of dumbbell squats (3 x 5 @ 50lbs) since I’m still trying to ease into leg lifts again without messing with my marathon training. 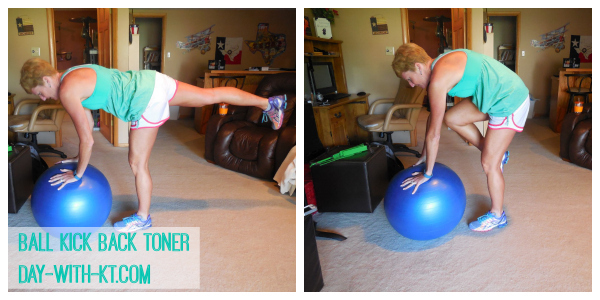 After the lifting portion of my workout, I did some stability ball exercises that Kim posted about back in June. I’ve been meaning to try these workouts since she posted them and finally took the plunge! To be honest, I’ve been putting it off because I have terrible balance, but I guess this will help! Again, I didn’t do everything in her post, but I did do…. I cannot lie to you, ^ those suckers will work you GOOD. It seems like such a simple, easy move where you’re basically lying down on a nice soft thing, but don’t be deceived! It’s harder than it looks! I probably looked like a fish flopping around out of water. I definitely plan on trying the other stability ball workouts later this week. Kim does each move 44 times, but I took the easier route and only did 30 reps each. Maybe I’ll work my way up to 44 next time! If you’re not already reading Meg and Kim’s blogs I highly encourage you to start today! They graciously share their workouts every week and are always happy to answer questions/give extra advice. Thank you Meg and Kim! Where do you find your workout routines online? Do you watch YouTube videos at all? 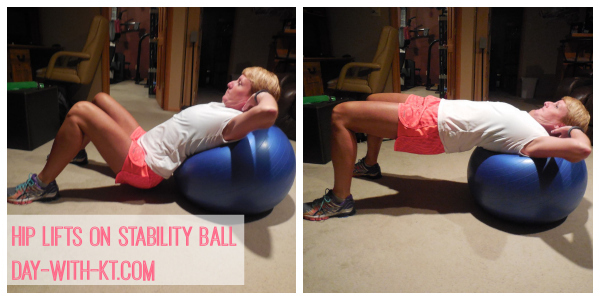 Do you ever do stability ball workouts? I really want to do more of these! The ball kickback toner seems fun…ooph I could already feel my legs burning after looking at hip lifts haha. The hip lifts were my favorite! The ball kickback was difficult for me because I have such poor balance! OH – thanks for sharing some of my moves!!! Oh please! You are not old at all! I find almost all of my workout’s online. Thank goodness for Pinterest! Planks are most definitely my biggest weakness as well! I would actually say the reverse leg lift was much easier than a plank… but you’ll definitely feel the burn by the time you get up to 30 reps! Sometimes I use the workouts from Runner’s World. Mostly I use my hand weights, or body weight and do strengthening/core exercises while hanging out with the kids at night watching TV. Sometimes we have “planking contests” or push-up contests! Thanks for sharing my workout and the blog love! I tried one of Kim’s moves yesterday- the “car wash” plank. I agree- she makes it look easy but it is actually HARD! I use a stability ball for the stability ball knee tucks (which I think you tried, they were on my video demo). I also used to do crunches on the stability ball, and sometimes use it to modify my push ups. I was scared I would fall over and other gym goers would see me. Thanks for sharing! 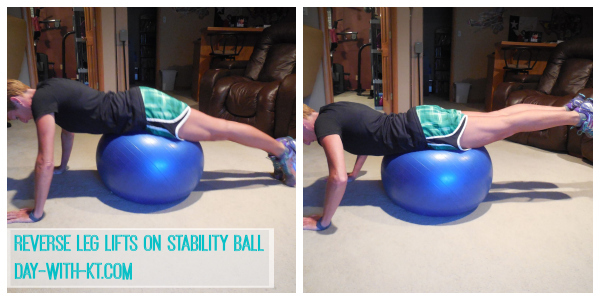 I am always looking for new ways to use my stability ball! I have a few YouTube vids bookmarked to work out to sometime, but never get around to them! I love Meg’s deck of card workouts! Yes! I keep saying I need to do her Deck of Cards workout… I really do!!! All props to Kim and Meg – they are the best! ï¿½I don?? ?t know what to advise we about mediating. I think this really is a choice that we have to come to ourselves, based about what?? ?s ideal for us. someone from around the world in a race to a given score.